How do I Keep the Faith-MMD? Who owns what in MikuMikuDance? Is there an MMD “honor system”? What are the rules when it comes to downloading MMD items? Who owns what in MMD and MMM? Everything in the MikuMikuDance and MikuMikuMoving worlds is FREE … no charge for anything but a few items which are charged-for or bartered-for by their creators. An MMDer can download almost everything she needs for her projects … and those things which she must create, herself, can be made using free software available online at the click of a link. But where does it all come from? … ? 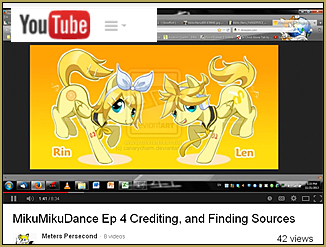 Everything has been created … is being created … by talented artists/MMD enthusiasts across the planet! Through their generosity they have put their artistic treasures online for us to find and utilize in our projects. We owe them a debt of gratitude; we owe them some form of “Thank you” for the works they have given to us. With great freedom comes great Responsibility! Everyone knows that once a file is uploaded to the web, it goes “Public”. The author or artist who uploads a file to share loses control of it … it’s out of his hands. As MMDers … as members of the global MMD Community… it is our responsibility to pay respect to the artists … to keep track of who created what and where we got it, so that we can give credit to the artists who create our items and softwares. It is the only payment that they will receive! LearnMMD has several articles, pages, and even a video describing methods for keeping track of your models, accessories and other items. Our respect for the creators of our files extends, also, to keeping track of any modifications or re-distributions of those files. Think about it; if we don’t really “own” the models … we really do not have the right to give them away to someone else. To redistribute a model, do not upload the file to make it available online. Instead, reference the website or dA page where you found the link. Send your reader to the creator’s page. The same applies to making changes to a model. It’s fun to customize a model to make it your own. Since you didn’t create the base model, you cannot really claim the modified model as your own. If you use your modified model in a video … be sure to mention that you modified the model and list the original artist’s credit. Do Not Share your modified model without clear permission from the artist. Most models come with a ReadMe.txt file in which the artist who created the model details his permissions as to sharing and modifying his model. Many times the ReadMe.txt is in Japanese! Learn how to translate those files into YOUR language. I have covered only a few points … there are a few more. Please visit the LearnMMD Keep the Faith-MMD page.